Why buy when you can make your own delicious Doggy Treat with this cute little kit! 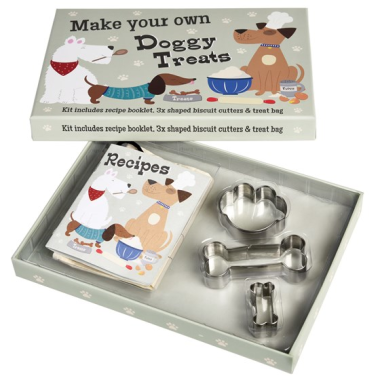 Go all British Bake off for fido with the Make Your Own Doggy Treats Kit which includes 3 biscuit cutters, a treat bag and even a little recipe booklet! Try carrot bites, banana and peanut bones, cheddar and rosemary bites and more. Makes a great Christmas Present for your little woofer!